The new Proton Beam Therapy Centre at The Christie, the internationally renowned cancer hospital in Manchester, is the first NHS facility of its kind in the UK. The building features a ventilated granite façade. LABM has all the details. The Christie is the largest single location cancer centre in Europe, treating more than 44,000 patients each year. The £100m high energy Proton Beam Therapy Centre built by Interserve Construction, part of Interserve Plc, is a five-storey, 15,000m2 unit, which includes a three-storey bunker where a cyclotron particle accelerator with an adjustable beam can be directed to any of three treatment rooms. Shackerley’s SureClad ceramic granite ventilated cladding system was specified as a major façade element to create a sense of synergy and cohesion with neighbouring buildings. Use of the system connects the new building visually with the existing Oak Road Treatment Centre, ensuring a level of familiarity for patients and their families. The cladding system was critical to helping achieve the key project objectives, providing a high-end finish that creates a clean, contemporary appearance. Meanwhile, the two contrasting shades of creamy beige and grey ‘Travertine’ façade panels used for the installation create a natural finish in soft tones that will offer a warm, welcoming feel to the building and a subtly reflective surface that connects the façades to the outdoor environment. 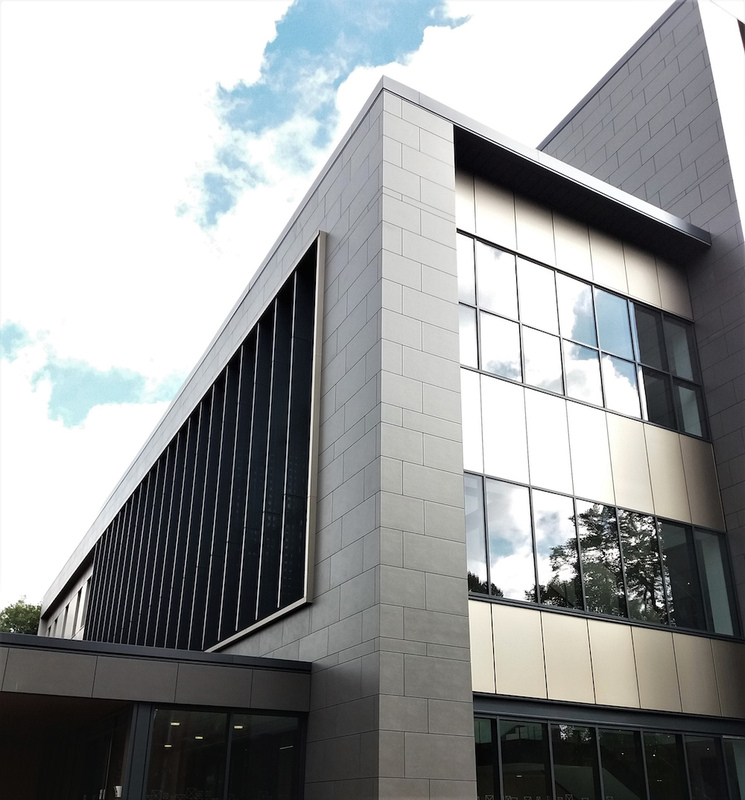 The building is accessed from Oak Road, so the visual synergy between the new facility and the Oak Road Treatment Centre provided by the cladding specification underlines the impression of a planned expansion of the cohesive campus. 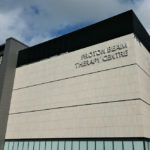 The Proton Therapy Beam building is physically connected to the main hospital via a glazed walkway, and the contrast of the creamy-coloured cladding with the transparency of glazing is evident throughout the design of the building envelope. The building’s heavy concrete structure, necessitated by the Proton Beam bunkers, made creation of texture and contrast one of the key design challenges. This was addressed by introducing natural light into the building, enabling views to the soft landscaping at the rear, and designating the main reception areas as a ‘winter garden’. Windows of varying sizes and curtain walling at ground floor level punctuate the façades. The patina of the façades helps to soften the building further still. While, from a distance the elevations appear to be solid blocks of grey and cream, on approaching nearer the building, the 1,198mm by 598mm panels help to achieve the non-homogenous aesthetic of the façade. The grey veining in Shackerley’s beige ceramic granite along with the lighter speckles of the grey panels also contribute to a less clinical, more natural aesthetic. In addition to answering the aesthetic aspirations of the Proton Therapy Beam project, SureClad system’s durability, uniformity and long-term performance offered practical, maintenance and whole life cost benefits. All panels of each colour way were fabricated from a single batch of ceramic granite, ensuring a precise match of colour and patina across the whole façade. Alongside the standard, large format panels, Shackerley also prefabricated a wide range of detailed and bracketed panel returns for window surrounds and corners to the specific delivery requirements of the programme. Every panel and detail was supplied fully prefabricated with all fixings, brackets and straps secured with undercut anchors, ready for immediate installation onto SureClad Access system. As an engineered material, the ceramic granite is comparatively lightweight and robust, with none of the natural fissures and imperfections associated with quarried stone. This reduces the structural loadings required by the system, reducing stress on the building. The fully–vitrified material has virtually zero porosity, as defined by BS EN14411. This means that the panels do not absorb contaminants and are completely unaffected by climatic extremes, as they conform to all international standards for freeze/thaw resistance, ensuring a robust, extended service life. The colour and patina will not fade, even after intense or prolonged U/V light exposure, and the non-combustible (Class A1 to EN13501-1) material also offers excellent resistance to acids, alkalis and graffiti and does not promote algae growth. 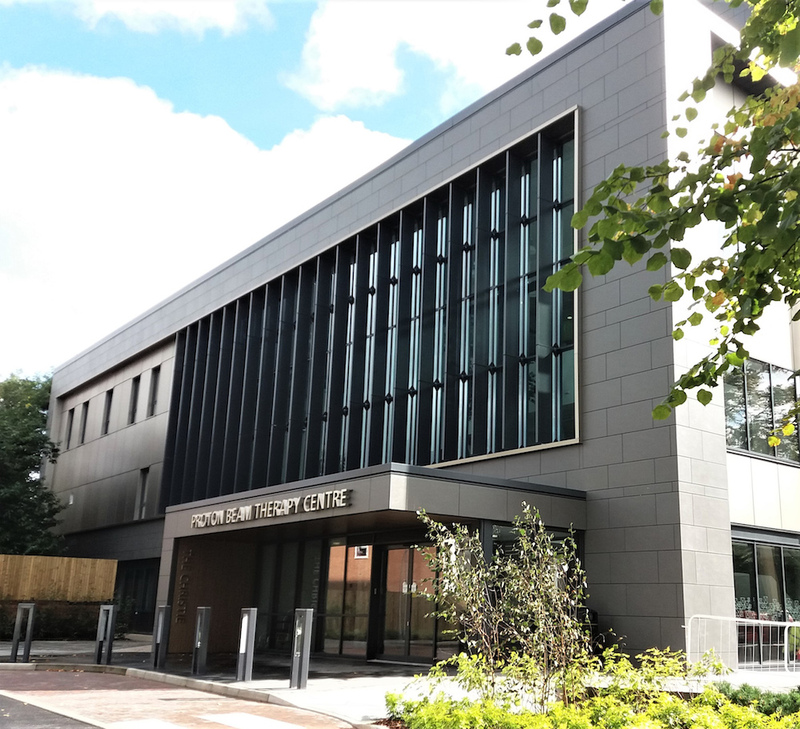 These attributes add up to a long-term façade solution and ensure that the Proton Beam Therapy Centre at The Christie maintains its attractive aesthetic with minimal maintenance for the service life of the building. The Proton Therapy Beam Centre marks the continuation of a proud legacy for Shackerley at The Christie, which includes specification on the Oak Road Treatment Centre, the Hospital’s Oldham site and the Integrated Procedures Unit (IPU), which is currently under construction.